I can't believe that we are already in November, where has the year gone? The Winter Invitational is on Thursday this week and we have a massive 59 players on the day. Please settle up with Pat, £17 members and £22 guests if you haven't already paid.. Order of play is on the notice board and has been emailed out. Please bring some cash on the day as there will be a raffle and Christmas cards on sale - all in aid of Sarah's Charity, the Essex and Herts Air Ambulance. After the Winter Invitational the Tuesday and Thursday 9 hole comps will both be via sign up sheets which Lin will put up on the board. Don't forget to sign up for the Christmas Jumper comp on Friday 15th Dec. The sign up for this is on the Club notice board and is open to all sections. 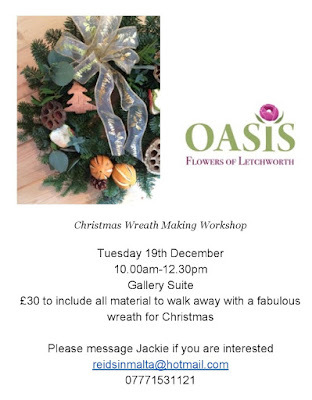 Please contact Jackie if you would like to come to the Christmas Wreath making Workshop on Tuesday 19th December. This will be held upstairs at Chesfield if 4 or more people are interested. Please see details below. A dry and mildish Stableford round was won by Vicky Thompson with 36 points and Lin Goodey was a worthy Runner up. Well done ladies. Again, a reasonable day for the time of year, the Daily Mail Foursomes competition was won by Team Chan! They will go forward to into the draw for the competition next year.